What is it with cats and quilts? This is Tilly. 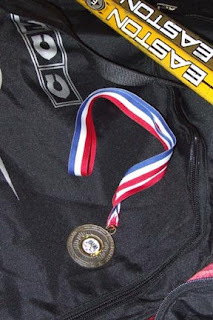 Another successful year of hockey was concluded last evening, at the arena in Springhill. Coach Ron arranged a terrific time of pizza, cake, pool and a fun game on ice. With tongue in cheek, he congratulated them on a great showing this season, noting that they had finished in second place nearly every game! Mix the dry ingredients together, then cut in the shortening till it's about the size of peas. Break the egg in the measuring cup and beat it. When you add the milk, you should have 1 cup of liquid, if not add to the 1 cup line (your egg may have been a bit small). Add the liquid to the dry ingredients and stir until just moistened. Turn out on a floured board and knead exactly 20 times (not 19, not 21: this is the key to good biscuits!) 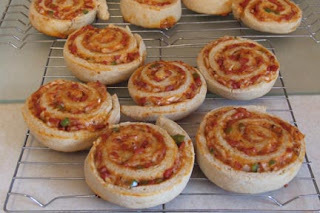 Roll not too thin for biscuits, but in a fairly thin rectangle for the pizza rolls. For the pizza filling, a small can of Gattuso pizza sauce is a good size (we like the "Spicy"). Mix it in a bowl with a cup of shredded cheese and various chopped pizza items: pepperoni, green peppers, mushrooms, onions - whatever you like. Approximately a cup total of pizza ingredients is about right for rolling - too much and it all falls out. When you have the sauce, cheese and vegetables combined spread it on the biscuit dough and roll up like a jellyroll from one short end. Cut into slices about 3/4 - 1" thick and place on a baking sheet lined with parchment paper. You will have enough for two pans. Bake at 400 degrees; my turbo-charged oven takes 8 minutes. Delicious! These are good cold also, and travel great in a lunch box to school. 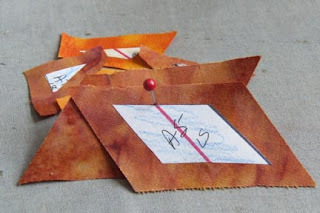 We all have our least favourite chores when it comes to quilting, and mine is basting. I like the designing, the sewing, the quilting, and I l-o-v-e sewing on that binding, but dread the tedious process of securing the layers. When I'm up for some exercise, I spread the quilt on the livingroom floor and use masking tape to hold the fabric taut while I pin. (The exercise part comes in as I have to move the furniture out to get a big enough space to do this.) 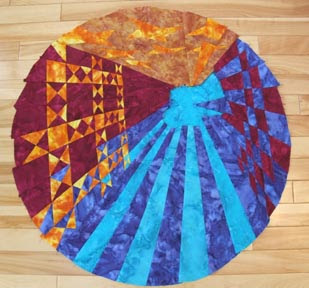 When the Grace Frame is not occupied with a handquilting project, it works wells for basting. 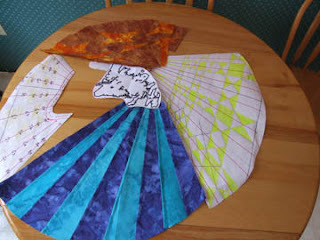 Here I have my Anticipation top in the frame, ready to be removed for machine quilting. This makes three quilts basted and ready to quilt. The finishing touch for any quilt is to have a label affixed to the back containing pertinent information about the quilt. The old "who, what, when and where" formula from news reporting is a good one to keep in mind. Some folks embroider a label, some use fine tip permanent markers to hand write the information. My favourite way is to make the label on the computer and include a photo of the finished quilt there as well. 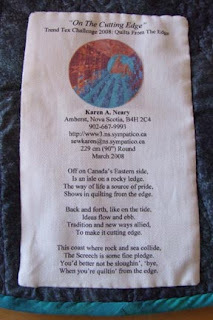 I print it on a purchased fabric photo sheet, or on cotton I treat myself using Bubble Jet Set. This label is a bit lengthier than most as I included the Artist's Statement. Here's what it looks like joined together. The plan is to show Newfoundland - the "edge" - at the vortex of sea and sky. I like the notion of the two shades of blue to represent the ebb and flow of the tide... the exchange and sharing of ideas coming in and going back out. A variety of circular shapes were collected from around the house. The kitchen cupboards seemed to yield the most choices. 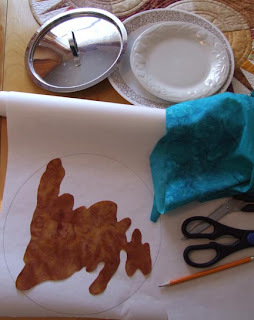 I traced around several sizes on white freezer paper and laid the cut-out of Newfoundland in place. After narrowing it down to a dinner plate or a pot lid, the winner was the Paderno saucepan cover. The centre fits nicely. 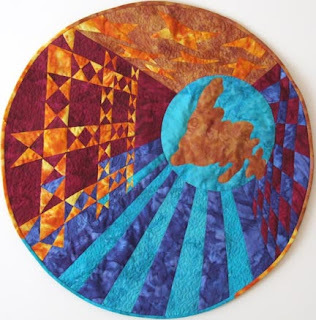 Now I just have to add Newfoundland, trim the outer edges, layer and start the machine quilting. There was just enough fabric to piece the bias binding for the outer edge. Whew! 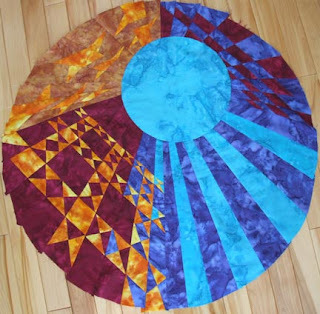 And here it is...Totally off the cutting edge *-) Remember to check out the Canadian Quilter's Association website to see more quilts made using the same five fabrics, and the same theme, "Quilts From The Edge." 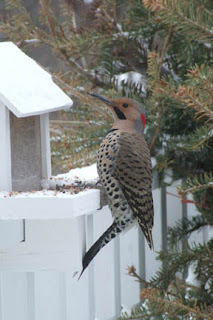 One more picture of a visitor from yesterday: this Northern Flicker stopped by to sample the home-made suet ball. What a handsome bird. 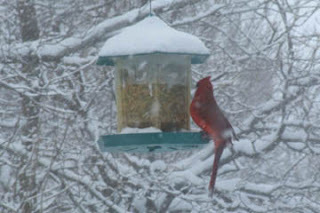 It's snowing now and the ice will start later this morning. Dave March has already announced that schools in Cumberland County are closed again today. 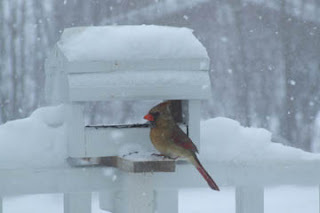 When storms are brewing, our feeders are very busy with lots of visitors including a pair of Cardinals who frequent our backyard. Mrs. Cardinal is quite bold and relaxed and seems to pose for the camera. Her vibrantly coloured spouse, however, quickly flits in and out not pausing long at all. His plumage makes him quite a target. Slowly the patchwork is beginning to take shape. I did the smallest and easiest sections first...just for incentive. It's important to see progress as you work. 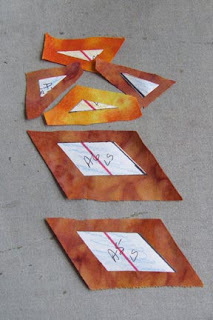 Before cutting the freezer paper sections apart, I drew a red line through the centre of each strip. It was a great help in aligning the pieces when sewing. 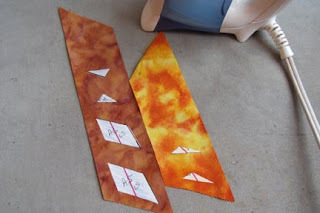 Each individual piece of freezer paper was ironed to the back of the appropriate fabrics and cut out with scissors. I added 1/4" seam allowance to each piece and then the daunting task of reassembling the sections began. 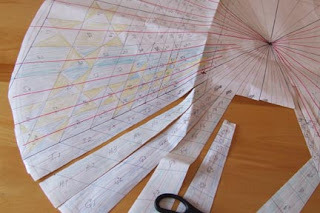 It was very much like making a jigsaw puzzle from fabric.